A doctor uses robotic arms to operate through small keyhole incisions in the abdomen. The robotic arms are able to do surgical tasks with an increased range of motion. They also can filter out hand tremor. The special tools translate the doctor’s larger hand movements into smaller ones. This allows delicate work to occur in small spaces. 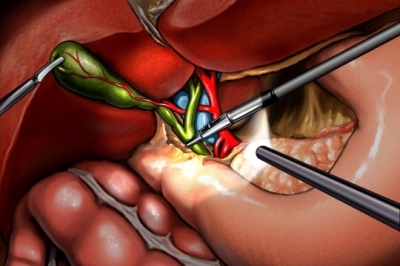 Close-up view of laparoscopic tools used to remove the gallbladder (green structure). Take a laxative and/or use an enema to clean out your intestines if instructed. Several small incisions will be made. They are called keyhole incisions. Carbon dioxide gas will be passed into the abdomen to expand it. This will make it easier for the doctor to view the area. The doctor will sit at a console, looking at the images on the screen. The robotic arms and tools will be guided by movements of the surgeon. Another doctor will stay by you to adjust the tools as needed. In some cases, organs or tissue might need to be removed. When the procedure is done, the tools will be removed. The incisions will be closed with stitches or staples, and a sterile dressing will be applied. This procedure is done in a hospital setting. The usual length of stay is 1-2 days. Your doctor may choose to keep you longer if you have any problems. Wash the incisions with mild soap and water. Limit certain activities such as driving and strenuous activity. Depending on the procedure, you should make a full recovery within a few weeks. Ruurda JP, van Vroonhoven ThJMV, eBroeders IA. 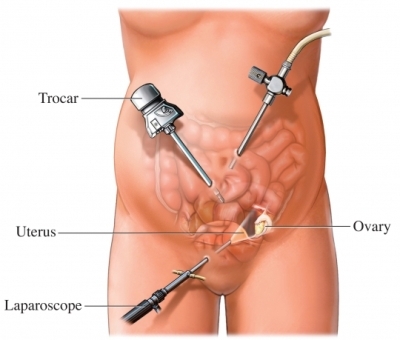 Robot-assisted surgical systems: a new era in laparoscopic surgery. Ann R Coll Surg Engl. 2002;84(4):223-226.